As an Esthetician, I love testing out new products and to see whether a brands' claim is true or not. This is especially true for brands that have high-cost products because c'mon, we all want to know if it's worth the splurge. I have always said that you don't need to spend a ton of money to have great skin but on the other hand, I do think you get what you pay for. When Advanced Clinicals reached out and asked me to test out 2 serums that were under $20 each, I jumped at the chance. I mean, who doesn't want to know if a $10 skincare product can work just as well as an $80 serum. If you want to know how these products fared, just keep reading. 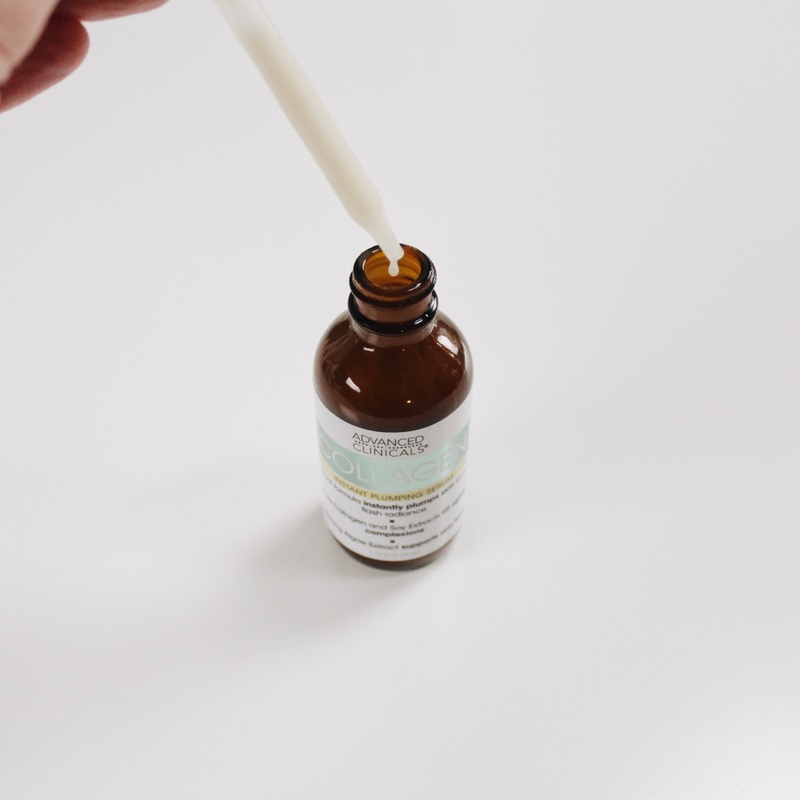 Advanced Clinicals is a Chicago based, problem-solving skincare line that stands behind using only the highest quality ingredients, making products that offer results. The brands' mission is to offer skin care solutions at attainable prices, so all of their products retail for under $20. The brands' mission is to create products that help the customer see and feel results within weeks without breaking the bank. Accessibility is also a priority! 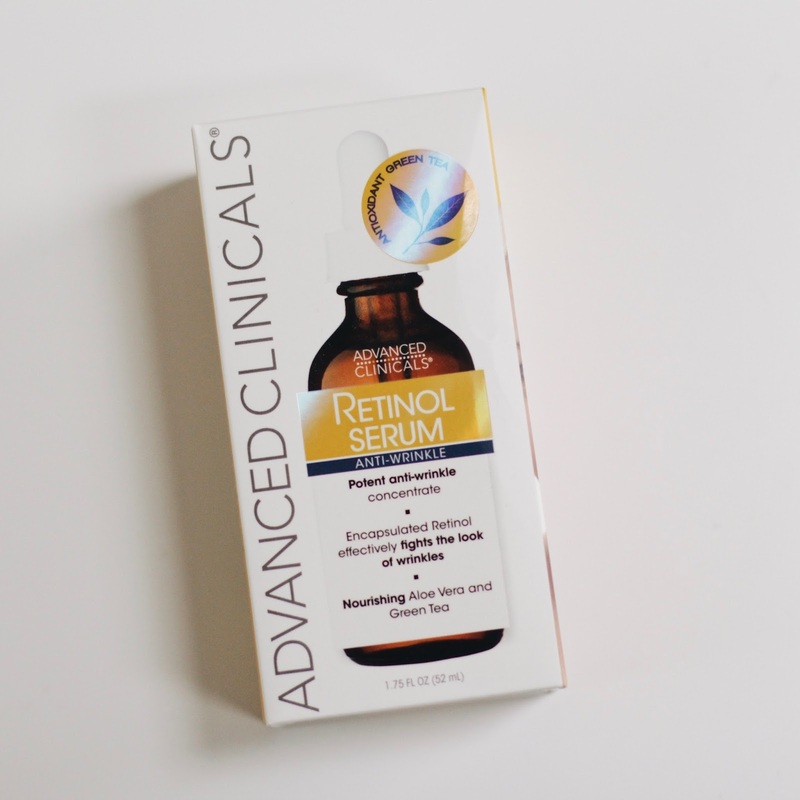 Advanced Clinicals has made it easy to access their wide range of products, with the Retinol and Collagen Serums available for purchase at select Walmart locations nationwide. This claims to improves the look of fine lines and wrinkles, firm, increase hydration/lock in moisture and plump the skin. This claims to correct the look of fine lines, deep wrinkles, firm and help replenish volume. This also says it helps improve sun damaged skin, even out skin tone and brighten the complexion. I always like to start my reviews by stating my skin type and conditions at the time of the review. If you follow me on Instagram, you will know that my skin can get sensitive and I am currently battling perioral dermatitis. I am also acne prone, however, with the incorporation of treatments like Differin seen here, my skin seems to be less prone to breakouts but more easily dehydrated and flaky. My review will reflect how these products work for my personal skin type and condition and as a disclaimer, your results may vary. Every product I use goes through a very detailed patch testing period. I always patch test and I recommend patch testing to everyone. Although, there is an argument out there that patch testing doesn't actually work, seen here on The Beauty Brains, patch testing has saved my skin from some pretty serious negative reactions. Although, I do agree with TBB (and love this podcast btw) that patch testing does not work against evaluating whether a certain product will cause breakouts, patch testing will help determine if your skin is allergic to the ingredients and/or the formulation. This type of negative reaction is seen in the form of itching, stinging, intense flushing, burning, rash or hives. I introduce new skin care products to my easily irritated skin, by patching testing. Patch testing can look different for everyone but for me, I test products in stages. First, I apply to more sensitive areas like around my neck, chest and behind/in front of my ears. Then, I would apply a product twice within a 24-hour period. If all goes well, I begin to use the product on half of my face and then work up to using it all over. 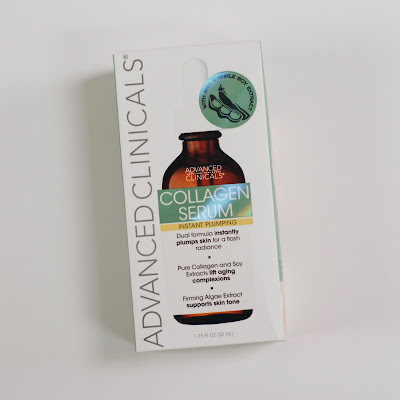 This is an olive-based, milky & watery serum that contains a soy complex collagen and algae extract to help target loss of elasticity and fine lines. Other ingredients include aloe vera juice (soothing), apple fruit extract (restoring), rice bran extract (reduces signs of aging, soothes, hydrates & protects), green tea (potent antioxidant), oat bran extract (skin conditioning/soothing), sunflower extract (protects, adds hydration), cetearyl alcohol (fatty alcohol, protects/emollient) and vitamin E which is a potent antioxidant that helps fight off free radical damage and speeds up cell regeneration. This is paraben-free but does contain soy, gluten (from oat), coconut fatty alcohol, lavender, citrus & rosemary extracts plus added fragrance. This is an olive-based, milky serum that is so dense, it feels like a lotion/emulsion. This contains retinol (vitamin A) which is one of the best ingredient to restore skin. This contains ingredients similar to the Collagen Serum above like aloe vera juice, green tea, oat bran extract, soybean oil, rice bran extract, sunflower extract, apple fruit extract, cetearyl alcohol (fatty alcohol) and vitamin E.
Again, like the Collagen Serum, this is paraben-free but it does contain coconut, gluten (from oat), soy, citrus & rosemary extracts plus added fragrance. This is a very watery, milky serum that is super lightweight and quickly absorbs into the skin. This is not sticky or tacky and actually has a silky smooth texture. This serum is great for those like me who love to layer their skincare products, because it is not heavy and works well with other products. I find that this has an instant soothing and cooling effect on the skin which is nice in the morning when I am half awake. I do think this does offer some extra hydration and increases moisture levels in the skin but I did not notice a lot of plumping. Any anti-aging results like the correction of lines and wrinkles would not be seen instantly. These results would take consistent use over many weeks to see the effects. Some cons for me is the scent, which to me smells like baby shampoo. Scents/fragrance is all about personal preference but on the plus side, it did dissipate. Another plus, is that this did not cause any negative reaction or cause breakouts. Overall, this did hydrate; provide extra moisture to my often dehydrated skin. At $8, it's not a bad product, especially if I was on a tight skin care budget. First, I am not completely sure the percentage of Vitamin A (retinol) that this contains but what I do know is that this is a very dense serum. The texture reminds me of a lotion or emulsion. On its own, it is hydrating and adds lots of moisture. If you have oily skin and applied this after cleansing, I don't think you would need more hydrating products as this would give you enough moisture. For those with dry skin, the added hydration is a bonus. I used this for a few weeks at night after cleansing and applied a thin layer all over my face, neck and upper chest. I did feel a slight tingle but no negative reactions or breakouts. 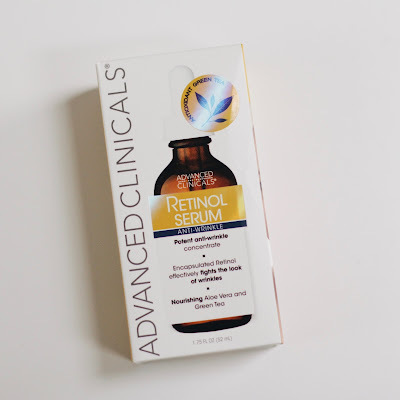 I consider myself a retinol veteran, as I have been using prescription retin-a for 10+ years, and while this did offer extra hydration and moisture, I didn't notice any other effects. Perhaps with consistent use, I would see more anti-aging results. Again, the box directions indicate that this is safe for daily use so my best guess is that this is a mild formula. This does have a baby shampoo/floral scent that again, did dissipate. 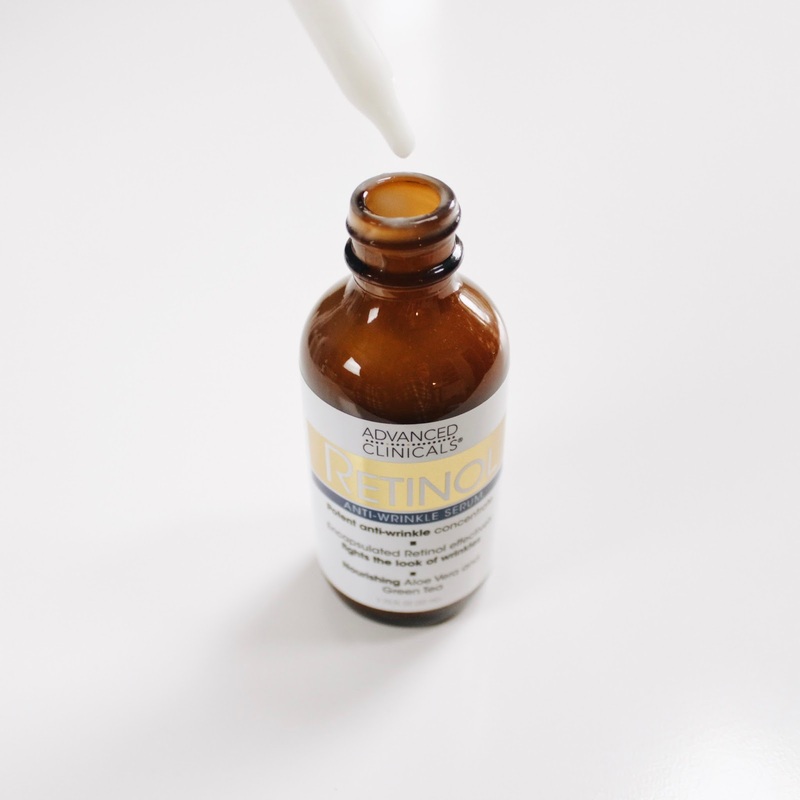 If I was new to using a retinol product and I wanted to experiment without using a prescription strength formula, I'd say this would be a good option and at $11, you can't beat the price point! You can purchase both the Retinol and Collagen Serums in-store at select Walmart locations nationwide.